Available for the first time in English language translation, the third volume of Totalitarianism and Political Religions completes the set. It provides a comprehensive overview of key theories and theorists of totalitarianism and of political religions, from Hannah Arendt and Raymond Aron to Leo Strauss and Simone Weill. 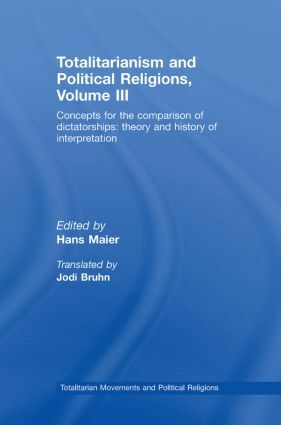 Edited by the eminent Professor Hans Maier, it represents a major study, examining how new models for understanding political history arose from the experience of modern despotic regimes. Where volumes one and two were concerned with questioning the common elements between twentieth century despotic regimes - Communism, Fascism, National Socialism, Maoism – this volume draws a general balance. It brings together the findings of research undertaken during the decade 1992-2002 with the cooperation of leading philosophers, historians and social scientists for the Institute of Philosophy at the University of Munich. Following the demise of Italian Fascism (1943-45), German National Socialism (1945) and Soviet Communism (1989-91), a comparative approach to the three regimes is possible. A broad field of interpretation of the entire phenomenon of totalitarian and political religions opens up. This comprehensive study examines a vast topic which affects the political and historical landscape over the whole of the last century. Moreover, dictatorships and their motivations are still present in current affairs, today in the twenty-first century. The three volumes of Totalitarianism and Political Religions are a vital resource for scholars of fascism, Nazism, communism, totalitarianism, comparative politics and political theory.